His description of the man was consistent with Dennis Oland's appearance. 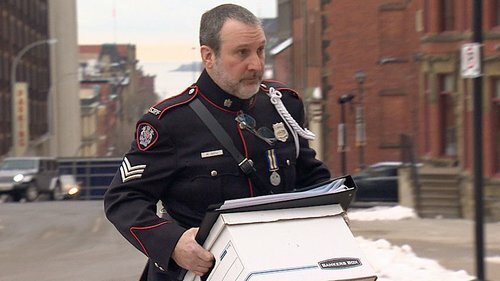 He testified at Oland's 1st trial in 2015 the bag appeared to have something in it but not something heavy enough for the man to be exerting himself. William Adamson was not called to testify at the retrial for health reasons. Crown and defence agreed video of his 2015 testimony could be entered into evidence. Prosser told the court he believes he had asked Smith if it was OK for Adamson to use the washroom because he wouldn't have allowed "just anybody" to use it. Still, Smith knew several officers had used the washroom and the risk of contamination didn’t preclude him from sending sink swab to lab, notes Lacy. Smith agrees. And it produced results - just nothing that implicated Dennis Oland? asks Lacy. Yes, agrees Smith. Smith has previously testified he didn't test the back door (which the defence contends would have been the preferred exit route of the "killer or killers") because it had been opened and therefore contaminated before he got to it. "The door and the door latch had been handled, negating my plan" to test it, Smith had said. During Oland's first trial, the defence had suggested Smith simply forgot about the back door. "No, sir," he had said. Lacy produces RCMP lab strategist's Bree Tucker's email to Smith, which says the lab cannot accommodate all of the exhibits he wants to send in the 25-day timeframe requested. "The reporting would simply be too complex," writes Tucker. "In the end, (if) you feel that every sample is essential at the time, I am afraid that I can only offer a 40 days turnaround time." Lacy suggests the reason police wanted the results so quickly was they considered Oland to be a flight risk. He refers again to Tucker's email. "I have approached the National Operations Manager and discussed your request for priority status, given the fact that the suspect is not in custody and is a potential flight risk," she wrote. Dennis Oland retrial is on lunch break. Back at 1:30 p.m.
Dennis Oland murder trial day #20 - afternoon session. Defence lawyer Michael Lacy is still questioning SJ police forensic specialist Sgt. Mark Smith. Lacy asking about basic police investigative procedure. In a case like this wouldn’t entrances and exits be important to investigate? Yes. A murderer has to come in and leave somehow? Yes. And you acknowledge if you had this to do over again you would do it differently? Yes. Limiting the crime scene to the 2nd floor office was a fundamental error you made? Yes. It's imperative you properly define the crime scene in order to ensure you can do your best to secure any potential evidence in relation to the crime? asks Lacy. Smith agrees. Limiting the Oland crime scene to the inside office was a "fundamental error?" asks Lacy. Yes, says Smith. If you could do it over, you would do it differently? Yes. Smith is making no excuses for himself. He’s not blaming others. Where there were problems he is acknowledging them directly. In 2015, you realized the necessity of developing some type of protocol for dealing with crime scenes? asks Lacy. Yes. 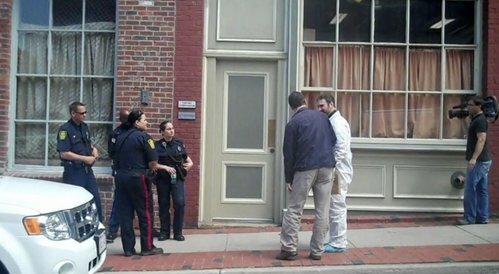 Much of what's in that protocol was not done at Oland crime scene in 2011? Correct. No quality controls were in place in terms of processing a crime scene in 2011? asks Lacy. Correct, says Smith. But you don’t offer that as an excuse because you knew better from your training, correct? Correct. Lacy is undeniably effective in dissecting problems in the way the crime scene was dealt with. He has obviously studied proper police investigative procedures in detail - best practices - and is comparing them step by step with what happened in this case. He’s even polite about it. “I appreciate your candor,” he tells Smith who is accepting the criticism and agreeing with it where appropriate. Lacy asking why the detailed techniques used by Smith on Oland’s car - special lighting; chemicals that highlight invisible blood spots - weren’t used at the crime scene on areas like the back exit door. You didn't do any examination at all of the door, correct? Lacy asks Smith. Correct. Not a single swab of the deadbolt? No. Not a single swab of the handle? No. No swab of the deadbolt lock? No. No swab of the door handle? No. You have suggested there was no point in testing the door because the RCMP would not agree to test a contaminated site. Yes. You didn't use any chemical reactants? No. You didn't use alternate light source, such as a CrimeScope? No. But you tested other heavily contaminated sites - like the office bathroom used by officers for days - and RCMP labs agreed to take that material? Yes. “I made a call and it was the wrong call,” Smith says about his decision not to test the back door. 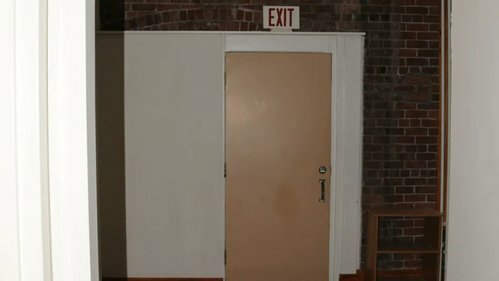 You previously suggested there was no point of testing the door because the RCMP lab wouldn't accept touch DNA because it had been opened and contaminated? asks Lacy. Yes. But you sent swab from washroom sink even though it had been used&contaminated by officers&Adamson? Yes. Smith, who has been calm and polite throughout the searing cross-examination says: "I don't wish to argue with you sir. I made a call on the 7th. It was wrong. I was just trying to explain to you my thought process." It was a "judgment call that was fundamentally flawed?" persists Lacy. Yes, agrees Smith. Do you agree you should take off protective shoe coverings and gloves every time you leave a crime scene and put on new ones before you re-enter? asks Lacy. Yes, says Smith. Because of risk of contaminating scene? Yes. It's "such a basic thing, I'm going to suggest to you, there’s absolutely no excuse why you wouldn’t have done that, do you agree?" asks Lacy. "I guess so." Prior to unveiling the picture Lacy had Smith agree that wearing protective clothing outside of a crime scene would be poor police practice.